"There is nothing like the silence and loneliness of night to bring dark shadows over the brightest mind." The Legend of Sleepy Hollow seemed like the perfect choice for an October book club read. Surprisingly, few of us had read the book, so we didn't know much about it except it was short and about a headless horseman. Or course, we all learned so much more about this Gothic tale and had a great discussion about how the short story came to be! 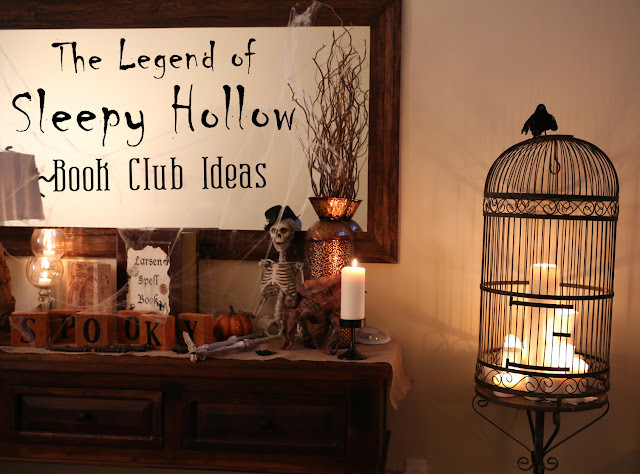 Break out your Halloween decorations because this book club is all about the SCARY. You can't do a creepy tale without some creepy decor. Low lighting, cobwebs, and any Halloween decor make for the perfect backdrop for this book. You have to have skulls and bones! Whitney set up her house with a sit down dinner before the discussion. I loved her black on black table settings as well as the black candelabras and real burning candlesticks. You can't have a discussion about The Legend of Sleepy Hollow without your headless horseman. Sadly, there is a guy in Whitney's neighborhood who actually plays a headless horseman every year, but he couldn't do it on our book club night. He has a real horse and all. If you can get one for your book club night, it would make it extra awesome. You can still make a sit down dinner elegant with paper products, Whitney chose the perfect black plates and bowls and even made it a little fancy with plastic wine glasses. Isn't this drilled pumpkin amazing? Whitney's husband drilled the holes in this pumpkin after they gutted it. You could paint yours white or black and add a light inside. Since the author of the book mentions the broken pumpkin at the end, you have to have some kind of pumpkin decor! Homemade ghosts always add to the creepiness factor. Hang them from chandeliers like we did here or from the ceiling. Cheesecloth, tissue paper or even napkins work well for these. I'm not exactly sure what Alix is doing to the skeleton here, but if you can get your hands on a full skeleton, it makes for the perfect scary decoration (and some fun laughs!). See, you have to have a skeleton at you book club night! We were all asked to wear our most GHOSTLY GOTHIC ATTIRE for this fun night and as you can see from our photos, we all interpreted it a little differently, but all of us had fun coming up with our outfits. Witchy dresses, corsets, black flowers, lace, black lipstick, and dark eye makeup seemed the theme for the night. I think that everyone dressed up for this one because it was easy to be simple or to go all out. Alix set up her fancy photo booth with a black and white striped backdrop. We love having a photo booth at our book club nights so that everyone can pose away during any part of the evening. Whitney B. makes being scary absolutely gorgeous, and her little man's sleepy eyes totally work well for this book! I think we all learned how scary everyone can be! Seriously, we are soooo scary. Wait until you hear about the scary stories we had to write later. Kylee is out resident makeup expert (we actually have several in book club). Isn't this intricate drawing amazing?!? She looks so gorgeous here, you wouldn't even believe she was Voldemort at our Harry Potter book club retreat! Our babes tend to like to dress up at book club here. Jen's little gal wouldn't be complete without her black dress and this cute one-of-a-kind bow. Jen even added netting to match her own costume. Kaylynn had her expressions and makeup spot on! 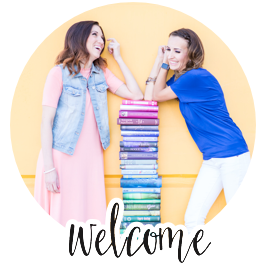 If you need inspiration for any kind of headdress for book club, Angie is your gal! I love that she added a spider to this Gothic piece. We are one scary bunch! Yummy apple cobbler with a granola topping - a perfect fall treat. Serve with vanilla ice cream. Whitney added some more fun scary decor items, including a picture book version of the book as well as more skulls and a witches brew. Yummy cornbread to go with our chili. You can't have a fall party without some yummy pumpkin pie. Normally I make things from scratch, but I found these yummy fall-inspired pumpkin scones at my local grocery store and just sprinkled them with powdered sugar..
You can't go wrong with a fall salad. This one has a bit of summer sprinkled in with strawberries and blueberries. YUM! Isn't this layer cake gorgeous! The web under the spider is easily done by running a knife through stripes of piped frosting in opposing directions. Add a plastic, candy, or gum paste spider to finish it off. Homemade chili makes for a great warm dish on a cold fall night. Fall donuts? Why, yes we did. We always intend on starting the book discussion on time, but the atmosphere, the food, and the company always makes us run a little late. Sparkling cider filled our wine glasses as a finishing touch to our dinner. Don't you love the plastic lace tablecloth? Whitney B. handed out a quiz right after dinner with questions from the book. Some of the questions were super hard, but we all tried our best because we wanted to win the prize. You can get ideas for questions here. While we took the quiz, Whitney B.. also started our scary story Round Robin (see how it turned out here). Each person on two teams was given a chance to write two sentence to add to a group scary story. Once everyone finished, we headed to Whitney L.'s backyard to read the stories aloud around the fire. Then we finished our discussion. Much of the discussion included how the book was different than most of us expected, our favorite and least favorite parts, and how this story was the starting point to many similar stories about a headless horseman. Thank you to Whitney B for Moderating and Whitney L for hosting this fun night! And a huge Thank You to Alix for all the beautiful Photos.